You can make a perfect piccata, really! This meal requires no culinary school and less than fifteen minutes of your evening. The dish starts with tender all-white-meat chicken pieces, battered in flour and corn starch and lightly cooked in a creamy lemon piccata sauce with roasted portabellini mushrooms on a bed of al dente Mafalda pasta. 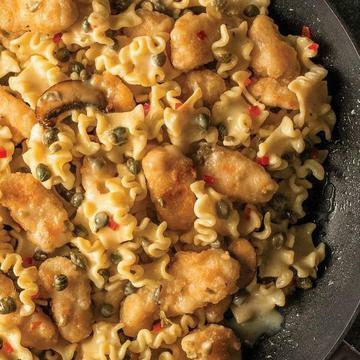 Capers add a salty touch to the dish to balance the acidity of the lemon, while a pinch of red pepper adds a little zing. If this sounds out of your range, don't worry... it's not! Put high-quality chef-inspired dinners on your table in less than fifteen minutes! You're the cook, but all the hard work's been done - planning, chopping, measuring, reducing sauces, etc. Just take the ingredients straight from your freezer and saute them in your favorite skillet! But this assistance doesn't mean you're not eating well... Skillet Meals are free of ingredients you can't pronounce. Bring this exciting, easy, one-of-a-kind meal into your dinner repertoire today! Each Skillet Meal serves two to three. Do not thaw! Keep frozen until ready to cook. Appliances vary, adjust cook time accordingly. Stove Top: Open meal bag and remove sauce. Thaw sauce by placing it in a bowl of HOT water while preparing the remainder of the meal. On stove top heat 10-inch NONSTICK skillet over medium heat. Add 1 tablespoon of oil and remaining bag contents to skillet. Add 2 tablespoons of water to the skillet, cover and cook for 8 minutes, stirring once at 4 minutes. Increase heat to medium high, remove lid and cook for 4 additional minutes stirring every minute. Add thawed sauce to skillet, stir to coat chicken and pasta and cook for 2 minutes, uncovered, or until sauce is hot and bubbling. Remove skillet from heat, cover and let stand for 1 minute before serving. FOR FOOD SAFETY AND QUALITY, FOLLOW THESE COOKING INSTRUCTIONS. FOOD MUST BE COOKED TO AN INTERNAL TEMPERATURE OF 165�F AS INDICATED BY A FOOD THERMOMETER. Ingredients: MAFALDA (WATER, DURUM WHEAT FLOUR, EGG WHITES, EGGS, WHEAT GLUTEN), TEMPURA CHICKEN (CHICKEN BREAST MEAT, WATER, WHEAT FLOUR, CORN STARCH, POTATO STARCH, CONTAINS 2% OR LESS OF CREAM OF TARTAR, EGG WHITE POWDER, GARLIC POWDER, RICE FLOUR, SALT, SODIUM BICARBONATE, WHEAT STARCH. COOKED IN VEGETABLE OIL), WATER, CREAM, FIRE ROASTED MARINATED PORTABELLINI MUSHROOMS (PORTABELLINI MUSHROOMS, CANOLA OIL AND OLIVE OIL BLEND, BALSAMIC VINEGAR, SALT, PEPPER), CAPERS (CAPERS, WATER, VINEGAR, SALT), BUTTER (CREAM, NATURAL FLAVORINGS), CHICKEN BROTH FLAVOR BASE (CHICKEN BROTH, NATURAL FLAVOR), CORN STARCH, VIRGIN OLIVE OIL, GARLIC PUREE, LEMON JUICE CONCENTRATE, SALT, SPICES, MONO-DIGLYCERIDES. CONTAINS: MILK, EGGS AND WHEAT.